Most people recognize lead as a toxic substance that has been heavily regulated since the environmental movement began back in the 1970s. Continuing research tells us that lead is even more hazardous than we previously thought, prompting bans on use of lead-based paint and drastically lowering limits that are allowed in drinking water and in the environment. Current information suggests that there is no minimum level for lead that is considered "safe." Lead safety is important to review, even for those who understand the risks. Newcomers to shooting may not realize they are exposed to lead every time they load, fire, or clean their handgun or rifle. Despite the concerns, the lead exposure can be controlled or eliminated by following just a few simple rules. Always wash hands after shooting or handling any kinds of ammunition. Never eat, drink or smoke when shooting, especially at an indoor range. Ensure that indoor ranges have proper ventilation and employ good housekeeping. Women and small children may be at greater long-term risks and should use extra care. Change clothes as soon as possible after shooting at an indoor range or after bullet casting activities. Launder all contaminated clothing before it is worn again. If you re-load, wipe down and vacuum work areas after every re-loading activity. If you cast your own bullets, use extra care to minimize lead contamination and exposure. Never melt lead indoors, on the stove, or where food is stored or prepared. Apply "extra care" with 'extra exposure". Lead has been in continuous use for at least 2500 years, mostly because of its low melting point (approx. 620 F) which is easily reached with a simple a wood-burning fire. Lead "bullets" were first used as projectiles for slings as early as 400 B.C. At the height of the Roman Empire, lead was routinely used to make 'pipes' and fixtures for plumbing. When the manufacture of firearms began in the 1500's lead was readily available - and has been used ever since for bullet making. Today's technology includes include some variations, such as bullets that have been fully encased, or 'jacketed' with copper. These are referred to as "Total Metal Jacket" (TMJ) and, like non-lead substitutes, are the safest to use when trying to reduce exposure to lead. 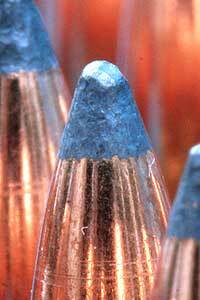 Other common versions of jacketed bullets include full metal jacket, and jacketed hollow-point (FMJ and JHP) bullets. There are even semi-jacked bullets that only partially encase the lead, leaving an exposed tip. We will explore these in a bit. The atomic symbol for lead, Pb, comes from the Latin word "plumbum" which undoubtedly relates to its historical use by the Romans. Pure lead has a bright-silvery appearance that dulls with time to a dark grey lead oxide ('tarnish') as the lead reacts with oxygen in the air. The lead also reacts with moisture and carbon dioxide that are also in the air. Those reactions cause the lead to form a mixture of lead hydroxide and lead carbonate which are light grey, to white in color. These are toxic forms of lead that pose the greatest health risks for gun enthusiasts. Any moisture on your hands or skin quickly picks up these forms of lead. Once the lead gets on your hands, it is easily transferred to the mouth or even the foods we eat. With each successive exposure, lead accumulates in the body which increases our risk of chronic, or long-term poisoning. Unless you work in the lead industry, the chances of getting acute lead poisoning are minimal. The concern for gun enthusiasts is that repeated exposures, even in small amounts, can accumulate in the body over time. 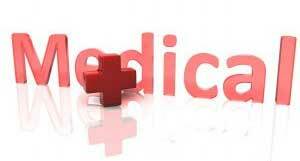 Intuitively, this means that children and young adults are at greater risk than older adults. Also, women are generally at greater risk than men, and should not be exposed to lead during pregnancy. Early symptoms of lead poisoning in adults may go unnoticed and include depression, loss of appetite, occasional abdominal pain, nausea, diarrhea, constipation, and even muscle pain. Other symptoms can include malaise, fatigue, decreased libido, and problems with sleep. An unusual taste in the mouth and personality changes can also be early signs of exposure. At higher levels, lead causes neurological effects to the central nervous system such as insomnia, delirium, cognitive deficits, tremor, hallucinations, and convulsions. According to OSHA, lead overexposure is one of the most common overexposures found in industry and is a leading cause of workplace illness. The permissible airborne exposure level for an 8 hour work period is therefore limited to 50 micrograms per cubic meter, a very small amount. For drinking water the limit for lead is technically 'zero', with an action level of 15 parts per billion. Lead poisoning is determined by looking at the concentration of lead in blood. Under normal conditions the concentration is < 10 ug/dL for adults. Elevated levels indicate increasing levels of exposure, and higher levels indicate poisoning. Some of the lead we are exposed to builds up over time in body tissues. This is referred to as 'body-burden' and is the reserve of lead that influences levels found in the blood. Releasing just a half-milligram of toxic lead to the blood stream of an average adult is enough to reach this minimum level. In perspective, that half-milligram of lead released to the blood stream compared to a single 158-grain bullet (15 grams of lead) is enough to impact 30,000 people. Needless to say, there is a reason to exercise care when handling lead and any of its compounds. Because our exposure to lead is cumulative, the best means for control is to keep all exposures to lead as low as reasonably achievable, or ALARA. This is a term that is often applied to radiation safety and exposure to known carcinogens - but is key to controlling exposures to lead. Lead is one of the most prominent metals on the earth. We get natural exposures from airborne dusts, water, foods, and casual contact with lead-bearing soils and minerals. At these levels, blood concentrations will be well below threshold levels of 10 ug/dL that indicate increased exposures to lead. Generally, the goal for safety is simply to control exposures any time we handle lead or come in contact with lead oxides and residues that are also hazardous. The more hazardous materials are distinguished by their light grey to white crusty deposits on the lead surfaces as opposed to the dark-grey appearance of oxidized (i.e. tarnished) lead. For safety, apply the mindset that any forms of lead should be regarded as dangerous and that any contact can result in exposure. Because lead can accumulate in body tissues over time it is also important to avoid repeated exposures to lead. This means that shooters who go to the range more frequently, or engage in shooting activities on a regular basis should exercise a greater degree of care than for example, someone who visits a range only once or twice a year. Following the 'rules' every time you engage in the shooting activities will ensure safety if they are applied rigorously. Though very small, these exposures occur every time we handle ammunition, shoot at a range, or clean up a weapon that has been fired. We need to apply extra care whenever we go to an indoor range or when we re-load ammunition since these activities often result in higher exposures. We will explore these in the next section. The best approach to lead safety is always to keep exposures "ALARA" - As Low As Reasonably Achievable. ALARA is a goal that can be easily reached. Thoroughly wash hands after shooting or handling ammo. Change into clean clothing as soon as possible after visits to an indoor range or after bullet casting and wash clothing before re-use. Never eat, drink, or smoke while handling ammo, shooting at a range, cleaning a gun, or re-loading ammunition (e.g. 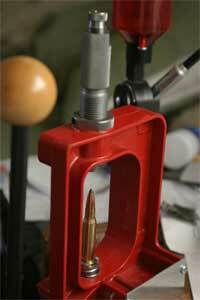 bullet casting). The activities we engage in that expose us to lead and its compounds include handling ammunition, shooting at an indoor or outdoor range, cleaning guns after use, and, for some of us, re-loading activities like those that involve bullet casting. Observing just these three rules any time we encounter lead will ensure that goals for ALARA have been met. Handling any kinds of non-jacketed ammunition results in direct exposure to the metallic lead contained in the bullet. The lead may be bright and silvery, or dark grey in color. Often ammunition from the factory has gone through a lubrication process that leaves a waxy film over the surface of the lead. These lubricated bullets reduce the reaction of lead with air and moisture but does not eliminate the risk. Older ammunition that has lost this protective film can be identified by a light-grey appearance. Lead in this form is more of a health concern because the chemical form of the lead is picked up easily by the moisture on our hands and skin. Wear protective gloves before handling any ammunition in this condition. If the ammo is to be used, a recommendation is to wipe the bullets with a moist (not wet) cloth to remove any transferable lead powder and then coat with a light film of petrolatum, beeswax, or commercial bullet lubricant. Then follow normal precautions for handing leaded ammunition. Bullets that are heavily corroded should not be handled or used. The moisture from our hands picks up even the smallest traces of the soluble lead present on the bullets. Common activities such as eating, drinking, or smoking after handling any kind of lead-based materials can result in direct transfer to our mouths, or from handling foods that we eat. Lead compounds generally have a sweet taste which can mask incidents of exposure from ingestion or transfer to the lips and mouth. Keep in mind that even small exposures have a cumulative effect, which means blood levels will build up over time. Always wash your hands after handing any kinds of ammunition. Avoid wiping your hands on clothing after handling or loading ammunition as residues will be transferred to clothing - and back to your hands. The key point to remember is that exposure to "any" amount of lead should be avoided if at all possible (ALARA). With the exception of non-lead ammunition, handling TMJ or FMJ bullets will be safest, but there can still be a concern from lead dusts and residues that may be present on even the shiniest copper jackets. Fully-jacked ammunition that is taken to an indoor range, for example, and brought back home can be contaminated with lead residues from the range! Semi-jacketed and JHP ammo still expose shooters to lead tips, which under the concept of ALARA also needs to be avoided. In addition to washing the hands after handling ammunition, a good practice is to use a clean cloth sprayed lightly with silicone to wipe down ammo used for self- defense before it is loaded. This will remove any traces of transferable lead and will reduce future (unsuspected) exposure when rounds are removed and reloaded for gun maintenance, or when the rounds are changed out for target practice. Thanks to rmgimages, and Drab Makyo for use of the cc images.